Turkey ( i/ˈtɜːrki/; Turkish: Türkiye [ˈtyɾcije]), officially the Republic of Turkey (Turkish: Türkiye Cumhuriyeti ; pronounced [ˈtyɾcije d͡ʒumˈhuɾijeti]), is a transcontinental country in Eurasia, mainly in Anatolia in Western Asia, with a smaller portion on the Balkan peninsula in Southeast Europe. Turkey is a democratic, secular, unitary, parliamentary republic with a diverse cultural heritage. 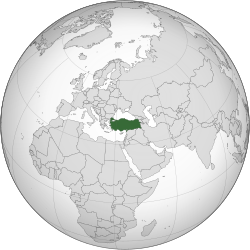 Turkey is bordered by eight countries: Greece to the west; Bulgaria to the northwest; Georgia to the northeast; Armenia, the Azerbaijani exclave of Nakhchivan and Iran to the east; and Iraq and Syria to the south. The Aegean Sea is to the west, the Black Sea to the north, and the Mediterranean Sea to the south. The Bosphorus, the Sea of Marmara, and the Dardanelles, which together form the Turkish Straits, divide Thrace and Anatolia; they also separate Europe and Asia. Turkey's location has given it geopolitical and strategic importance throughout history.